"They shall not grow old as we who are left grow old. Age shall not weary them, nor the years condemn. At the going down of the sun and in the morning, we will remember them..... "
The State President, Mr P. W. Botha (second from right) and Lieutenant- General I. R. Gleeson, SSA, SD, SM, Chief of the South African Defence Force Staff (right) take the salute during the playing of the national anthems of France and South Africa with, from left, Mr Gaston Duclercq, mayor of Longueval, General J. Guichard of the French Army, Military Governor of Lille and Mr G. Fontanelle, Prefect of the Peronne district, representative of the French Government. FEW battles in the annals of South Africa's military history have had such a grip on the imagination as the Battle of Delville Wood, fought near a small northern French village, Longue-val, in July 1916, during the Somme campaign in World War I. With the passing of time, Delville Wood for South Africans has become hallowed ground in a foreign land: a symbol of courage and perseverance, a personification of the steel and en­durance of the South African soldier, under the most terrible circumstances. Seventy years after Delville Wood a large contingent of South Africans of all races visited Delville Wood on Ar­mistice Day (November 11) last year, travelling to France to pay tribute to the South African volunteers who fought there and other military veterans who served and fell in wars on foreign soil. Although last year's group was by no means the first to undertake a pil­grimage to Delville Wood, it was by far the largest and most representative so far to attend a commemorative service and ceremony at the battle site. A contingent of more than 400 South Africans and about 1 500 French guests gathered on that day to pay tri­bute to comrades who fell in two world wars and the Korean War and to those who participated in the Berlin Airlift. The South African State President, Mr P. W. Botha paid a private visit to France to open the new Delville Wood Commemorative Museum on Novem­ber 11, at the invitation of the Delville Wood Commemorative Museum Fund Raising Committee. The idea for such a museum orig­inated with the war veterans of South Africa who are determined to raise the money, through public support, to cover all costs for the erection of the building. The case was put to the Cabi­net on the initiative of Mr R.F.Botha, Minister of Foreign Affairs and matters developed from there. Government has, in the meantime, provided build­ing funds, until such time as the Del-ville Wood museum fund is strong enough to carry all costs. In the group accompanying Presi­dent Botha were Presidents or other high-ranking representatives of the re­publics of Transkei, Venda and Ciskei, South African Cabinet Ministers and parliamentarians of all political per­suasions, Chief Ministers or other high-ranking representatives from the Black national states of KwaZulu, Lebowa, Gazankulu, QwaQwa and KwaNde-bele. Military veterans from different wars, including a few from World War I and members of the South African De­fence Force, represented the military, while South African ambassadors and other representatives in Europe and Britain also attended the ceremony. 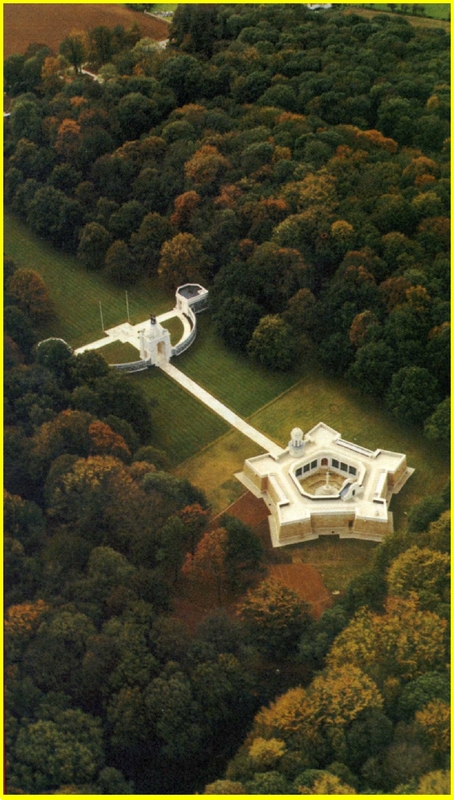 An arial view of the South African National War Memorial and the Delville Wood Commemorative Museum. The museum, which was officially opened by State President P. W. Botha on November 11, is a replica of the Castle in Cape Town. It was built in commemoration of South Africans of all races who participated in World War I and World War II, the Berlin air Lift and the Korean War. Only one tree, a hornbeam, which still grows behind the second bastion, right, was left standing after the battle. 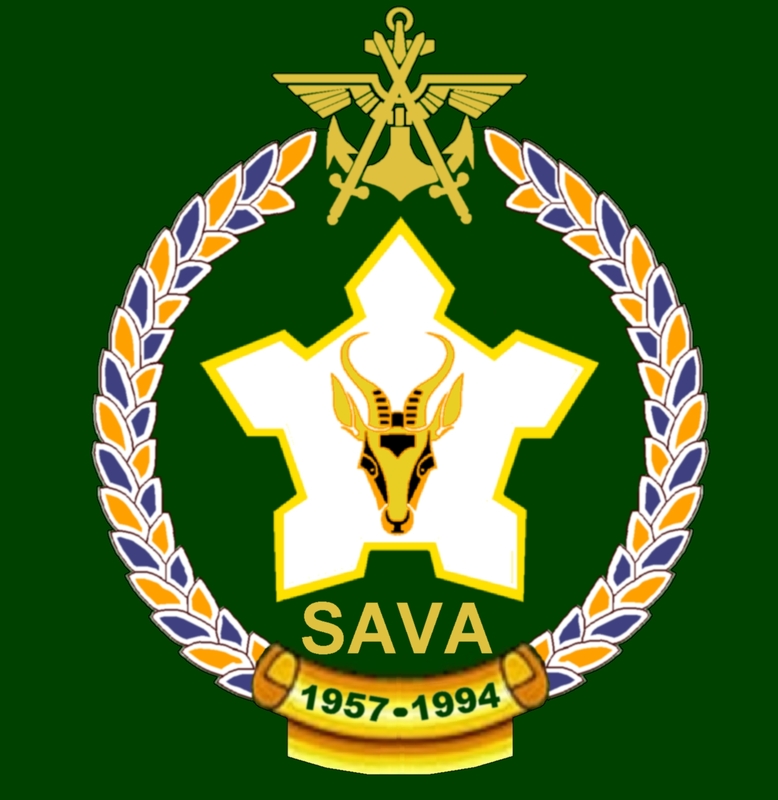 Tribute to the South African Forces - contd. The French were strongly represen­ted by military veteran organisations and many people who have friendly ties with South Africa. The French Government and Defence Force were also represen­ted, as well as trie British Common­wealth War Graves Commission. South Africa's involvement at Delville Wood is described in a foreword to the brochure on the commemorative museum. After South African forces had de­feated the Germans in South West Africa, a South African field force was mustered to take on the enemy in Cen­tral and East Africa while an infantry brigade, artillery regiments and field ambulance units were assembled for service overseas. At the same time Cape Corps battalions were recruited to fight the Turks in Palestine. The infantry brigade, comprising the 1st, 2nd, 3rd and 4th South African in­fantry regiments, was first sent into ac­tion to defeat the Senussi in the West­ern Desert of North Africa, and then found itself in the Somme area in France as part of the 9th (Highland) Division of the British Army. On July 1, 1916 the British advance on the Somme was launched, with the salient of Delville Wood one of the keys to the whole situation. On July 15, the South African Brig­ade under command of General H. T. Lukin was committed to its baptism of fire on the Western Front, ordered to take, and at all costs to hold Delville Wood. 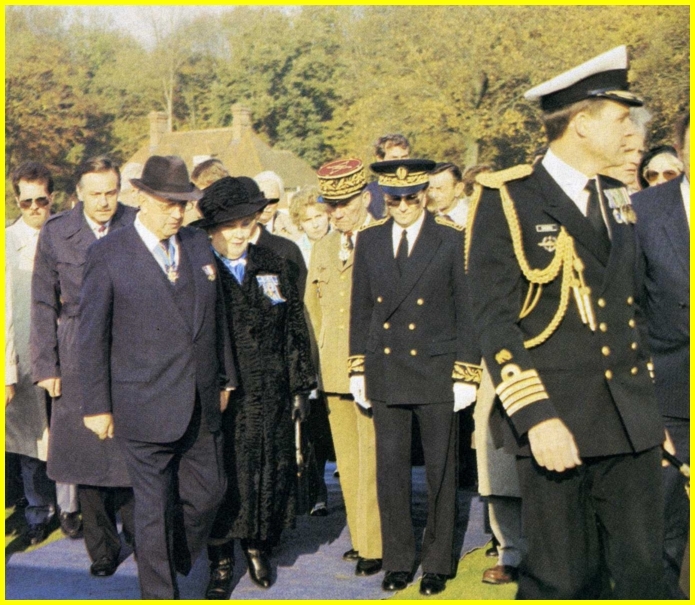 President and Mrs Botha move towards the War Memorial in the company of General Guichard (next to Mrs Botha) and Mr Fontanelle (in dark uniform at back) after the State President had lain a wreath in the graveyard of Delville Wood. In the forefront is Captain T. Ehlers, aide-de-camp to President Botha. There followed days of dashing attack, endurance under the hellfire of seven shells a second for eight hours on end, gallant and stubborn defence against elite battalions of the German Army, while contesting every inch of German advance and refusing to give ground. When relieved on July 20, only Colonel Edward Thackeray and two wounded officers, and 140 men, marched from the devastated waste that had been Delville Wood. These were the only walking remnants of a brigade numbering about 3500 men six days earlier. 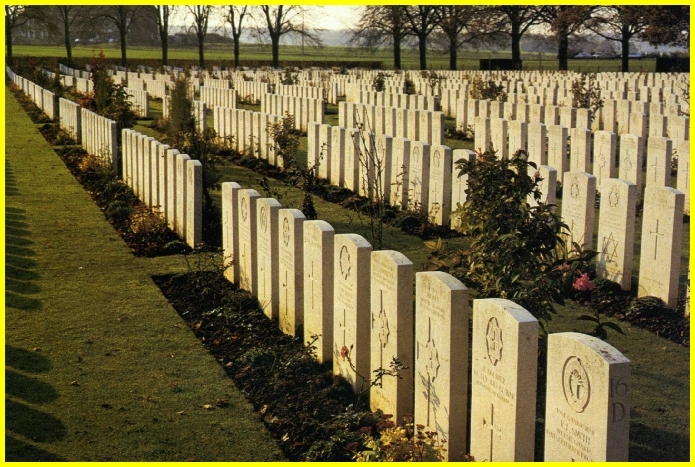 Some 700 of their comrades lay dead in the wood, while 2200 wounded had been evacuated. The rest, a small number, had either been captured when their ammunition ran out, or had, as stragglers, joined the flanking British or French units. Although the South Africans distin­guished themselves in various theatres of war, Delville Wood has gripped the imagination to such an extent that both the British and South Africans have al­ways shown great interest in these events. The following appeared in The Times, London, 1917: "No battlefield on all the Western Front was more bitterly contested than was 'Devil's Wood', where fighting, practically uninterrupted and intense, went on for six consecutive weeks from mid July till August 26 of 1916. It was in the first week of the struggle that the South African forces won their imperishable fame — grimly hanging on against overwhelming odds and re­pulsing counter-attacks by troops five and six times their number." In History of the First World War, Sir Basil Liddel Hart writes as follows: "... In the depths of Delville Wood, during the ensuing days, the South Africans made their supreme sacrifice of the war — where today a white stone collonade of peaceful beauty commemorates, and contrasts with, the bloodiest battle hell of 1916." In his book Delville Wood the South African author Ian Uys writes: "The Battle of the Somme marked a turning point in warfare. Beforehand cavalry was the supreme weapon, afterwards the tank and aircraft reigned. 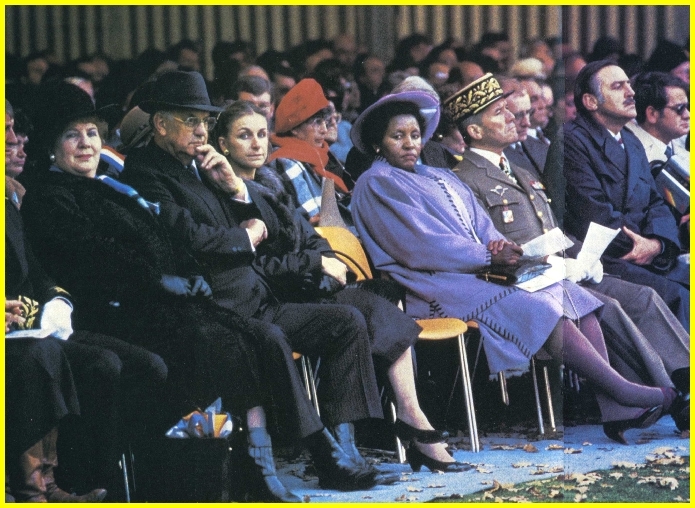 The State President and Mrs Botha, Mrs Fontanelle, wife of the French Government's representative, Mr G. Fontanelle, Paramount Chieftainess N. Sandile of Ciskei, General J. Guichard of the French Army and Mr R. F. (Pik) Botha, South African Minister of Foreign Affairs, listening to the commemorative service. On the airstrip from Paris Mr Justice M. T. Steyn (at back, left) chairman of the Delville Wood Commemorative Museum Fundraising Commitee, drinks a toast with a few World War I veterans and dignitaries. From left, front, Mr F. Ferreira, Colonel V. Wepener and standing, Mr H. E. Farrow, second from left, at back, is Ms C. Niven, daughter of Sir Percy Fitzpatrick, South African chairman of the commitee who worked for the building of the National War Memorial (1926) with, at the right, at back, Mr A. L. Vlok, former Deputy Minister of Defence (later Minister of Law and Order) and Major-General N. N. Webster, chairman of the South African Council of Military Veterans Organisations. 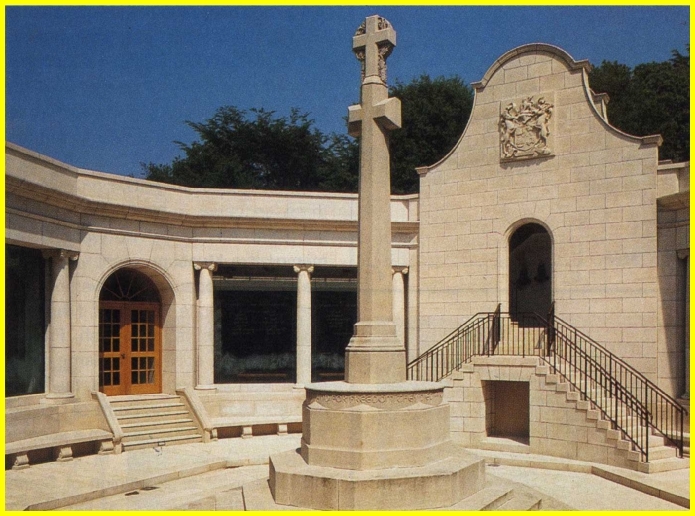 The first South African memorial was inaugurated ten years after the battle of Delville Wood on land that South Africa had bought from France. Due to the endeavours of fund raising commit­tees under the chairmanship of Sir Percy Fitzpatrick, KCMG, in South Afri­ca, and Sir Otto Beit, Bart, KCMG, in London, the South African National War Memorial could be built on the battle site. France later bought back the land for a nominal fee but granted South Africa its use as memorial ground in perpetuity. The South African National War Memorial, designed by Sir Herbert Baker, was handed over to the Gov­ernment of the Union of South Africa at its inauguration on October 10,1926. Following upon South Africa's par­ticipation in World War II, during which over 12 000 lives were lost world-wide, an altar stone, similar to the "Stone of Remembrance" found in Common­wealth War Cemeteries throughout the work), was erected in front of the cen­tral feature of the Memorial. It was un­veiled on June 5, 1952. Now the pentagonal commemorative museum on the site tells the full story of South African participation in wars of the Free World, which were fought in many parts of the world. In his opening address at the inau­guration of the museum President Botha said: "We have come together here to­day, to pay tribute to all South Africans who have given their lives for South Africa during the long course of its his­tory. Let this commemorative museum honour the sacrifices of the past, and, for future generations, be a symbol of the steadfastness of purpose of the soldiers of South Africa. "There are many ties between this terrain and South African soil, as there are between the blood and the people of France and South Africa. The oaks planted here in front of the great arch of the memorial, were grown from acorns which were gathered from the old oaks at Franschhoek in the Cape Province — whose parent acorns were taken out of France by early settlers three centuries ago. "This bond between our countries is more than a bond of blood, battles and oak trees. There is also a bond of values, beliefs and convictions. Before his departure from France, where he was on an unofficial visit to open the memorial museum at Delville Wood, President P. W. Botha held an international press conference in Paris. Here he replies to questions, flanked by the Minister of Foreign Affairs, Mr R. F. (Pik) Botha (right) and South Africa's Ambassador to France, Mr R. du Plooy. There is also a shared commitment to peace, freedom and justice. "In these days when the admirable virtues of courage, self-sacrifice, loyalty and love of country are held in contempt by many, it is fitting that we should remember the thousands of South Africans who, during the course of years, have died in the service of their country. The South African National War Memorial here at Delville Wood is thus a symbol of national unity and reconciliation for all South Africans of all times on all battlefields. "When commemorating the events of war, it is logical to talk about peace. War does not necessarily bring peace. The question may therefore be asked whether war is a struggle for peace, or just a battle for a new bal­ance of power. "In the world of the 1980's, peace is neither a luxury for the poor, nor a refuge for the weak. Peace must be se­cured by strength: physical strength, military strength, economic strength, strength of values and beliefs. Peace must be protected. It does not protect itself. Peace must be based on con­sensus around a system of values sup­ported by religious values, and striving for the highest social, economic and political values inherent in civilised traditions. 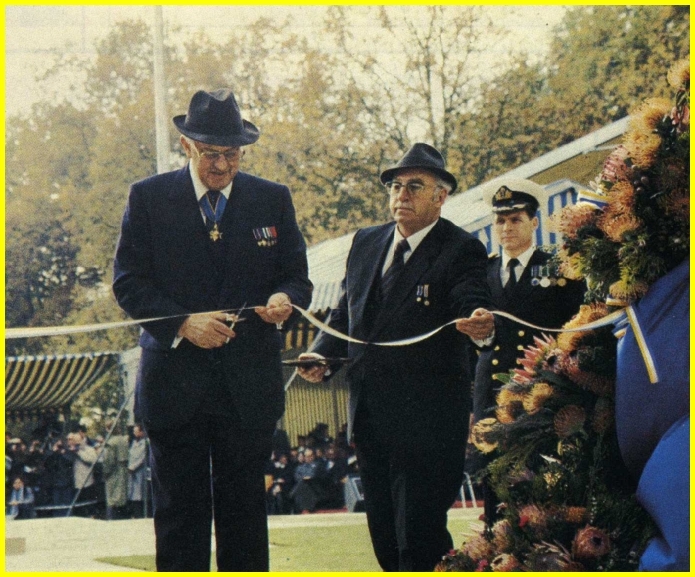 President P. W. Botha cutting the ribbon which marks the symbolic opening of the Delville Wood Commemorative Museum. At right is the Minister of Public Works, Dr L. A. P. A. Munnik. "The museum opened here today not only amplifies the memorial. By re­counting the joint sacrifices of our fallen It also demonstrates with striking clarity the underlying unity of peoples and individuals which has, for so long already, been a fact of our South Afri­can life and which binds us together with the bonds of common basic values and love of country, despite the stresses of change or of temporary political differences. That unity is also made apparent by those of us present here today." Those South Africans who lie here in this wood and many of those who lie elsewhere along the line of the West­ern Front, defended France in her hour of need, thereby also forging bonds of friendship between France and South Africa. That is demonstrated clearly by the participation in the ceremony of so many French comrades in arms and other friends, Mr Justice Steyn said. LISTENING to the far-off call of a world in distress, imploring aid in the name of mankind, of national freedom and of world peace, they re­sponded to the appeal and marched to the battlefields on land, sea and in the air." 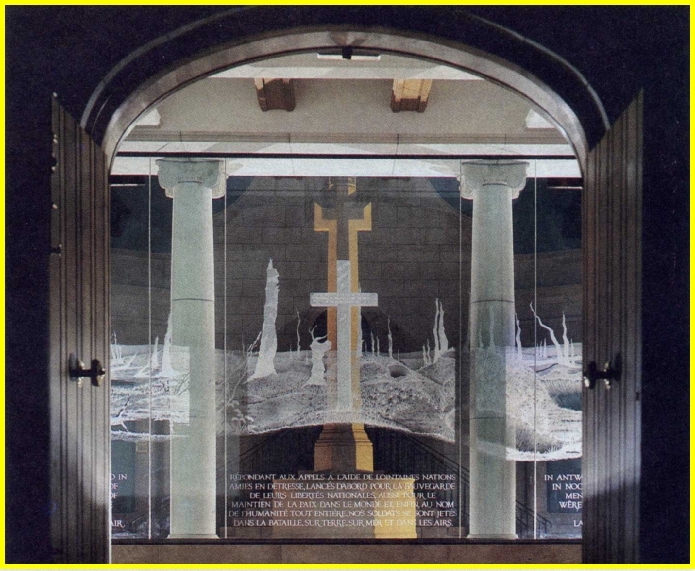 These words, engraved on glass in three languages in the entrance hall to the South African Delville Wood Com­memorative Museum, greet visitors to the museum, opened on November 11, 1986 by the State President, Mr P. W. Botha. The words, in English, French and Afrikaans, appear on a large glass panel with an engraving of the dev­astated wood after the Battle of Delville Wood. The inscription is from a speech made by General J. B. M. Hertzog, Prime Minister of the Union of South Africa, at the unveiling of the South African National War Memorial at Del­ville Wood on October 10, 1926. Mrs Botha, widow of the Union of South Africa's first premier, General L. Botha unveiled the memorial.The commemorative museum was built to pay tribute to all South African soldiers and those in auxiliary services who served and fell in battle on foreign soil. The building of the museum was made possible through the efforts of the South African Military Veterans Administration who felt the full story of the country's wartime contributions had never been told, and Mr R. F. Botha, Minister of Foreign Affairs, who put their case before the Cabinet. The facade of the new South African Commemorative Museum at Delville Wood in Northern France. 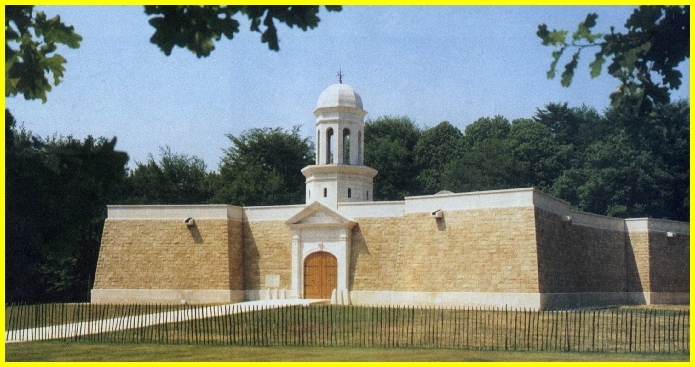 The pentagonal museum is a smaller replica of the Castle in Cape Town, South Africa's first fortified building and the oldest in the country which still stands. A committee was formed by the Depart­ment of Foreign Affairs, the Depart­ment of Public Works, the South Afri­can Defence Force and the South African Military Veterans Administra­tion, to take matters further. The museum houses paintings, mu­rals and articles depicting South Afri­ca's contributions in two world wars, in the Korean War and in the Berlin Airlift, and commemorates all South African volunteers who died on foreign soil. The Castle in Cape Town, South Africa's first permanent fortification and the oldest building in the country, inspired the design for the commem­orative museum. The building is a scaled-down version of the pentagonal Castle, a design which also forms part of the South African Defence Force emblem. The five bastions bear the same names as those of the Castle in Cape Town: Buren, Katzenellenbogen, Nas­sau, Orange and Leerdam. The names are derived from the titles of the 17th Century Dutch stadtholder, Prince Wil­liam of Orange. The architecture of the building blends with the other structures on the site — the South African National War Memorial and the Cross of Consecra­tion, which occupies a central position in the complex. The cross, in the court­yard of the museum, is visible through the large glass panels from all angles within. On large glass panels fronting onto the courtyard are engravings of battle honours awarded to the South African Forces during World War I, World War II, and the Korean War. South Africa's national flower, Protea cynaroides and the flower emblems of four provinces, Disa uniflora (Cape Province), Crinum bulbispermum (Orange Free State), Stertitzia reginae (Natal) and Zante-deschia pentlandii (Transvaal) are en­graved on the borders surrounding the battle honours. The administrative offices are housed in the bastion Buren and the other four accommodate the different exhibits. Katzenellenbogen depicts South African participation in World War I, in campaigns fought in Africa, Pales­tine and on the Western Front in Europe. A representation of Delville Wood after the battle, is engraved on a glass panel in the entrance hall to the museum. 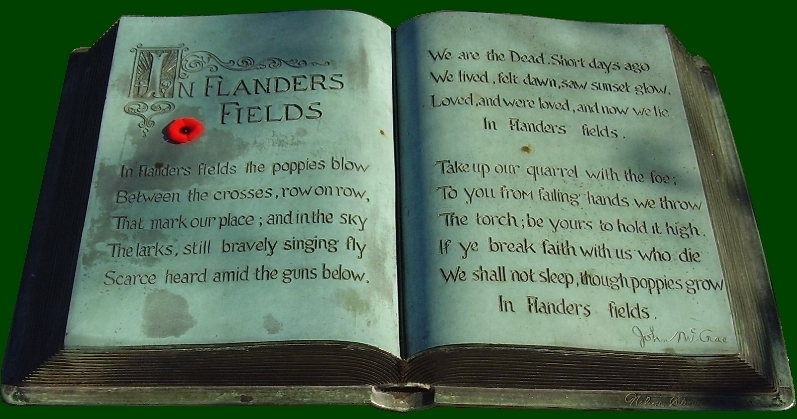 An inscription in English, Afrikaans and French from the speech made by General J. B. M. Hertzog during the opening of the South African National War memorial in 1926, is engraved at the bottom. Nassau is specifically devoted to the Battle of the Somme, with the accent on Delville Wood. The exhibits in Orange deal with South Africa's par­ticipation in World War II in Abyssinia (Ethiopia), Somaliland, North Africa and Italy, including air and sea opera­tions. South Africa's contribution to military operations in the Free World, specially the Berlin Airlift (1948-49) and the Korean War (1950-54) is rep­resented in the exhibits in Leerdam. Exhibits are displayed against a background of huge enlargements of historical military photographs. Batiks by Louis Steyn, which depict scenes from different campaigns and related events, adorn display cabinets of glass and oak wood. Four large paintings by Eben van der Merwe, depicting the provinces, Transvaal, Cape Province, Orange Free State and Natal, from which the soldiers came, adorn the entrance hall. The Cross of Consecration, situated in the centre of the museum complex, is a symbol of the sacrifice and ideals of the South Africans who volunteered for service in defence of the Free World. The cross, which bears the in­scription "For their faith and for free­dom they died", replaces the Cross of Sacrifice which is a common feature in cemeteries of the Commonwealth War Graves Commission, of which South Africa is a member. 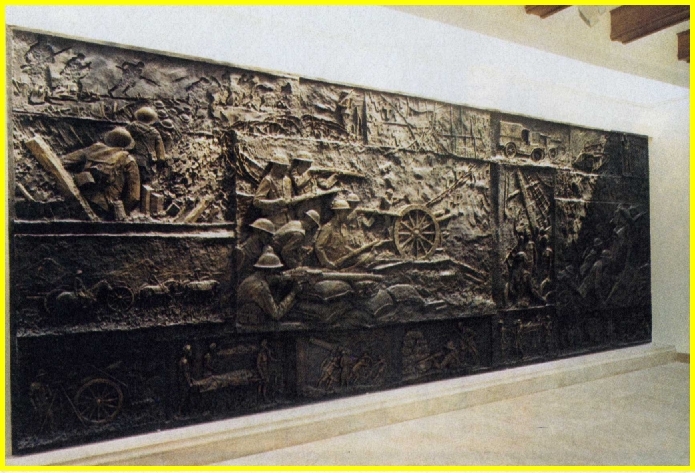 Large bronze murals cover the pass­ages that link the different bastions. South African artists Mike Edwards, Danie de Jager, Jo Roos and Tienie Pritchard created the four panels which depict scenes from the different wars in which South Africans fought. Mike Edwards was responsible for the first panel, which is a representa­tion of South Africa's participation in South West Africa, German East Afri­ca, North Africa and Palestine during World War I. Danie de Jager's panel depicts a group of exhausted soldiers leaving Delville Wood after six days of battle. 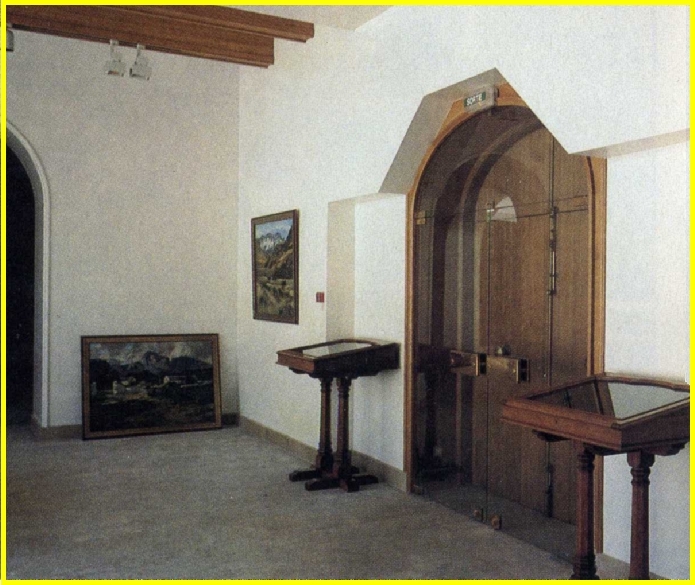 In the entrance hall of the museum are paintings by Eben van der Merwe, which depict the four provinces, the Cape Province, Natal, the Orange Free State and Transvaal, from where the soldiers came. This photograph was taken before all the paintings were hung. Indigenous South African oakwood was used for the front door and the tables for the visitor's books. 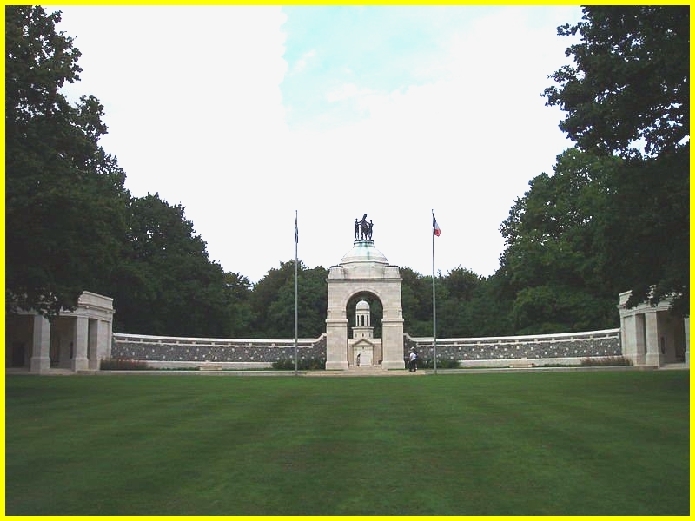 An estimated 80 000 people visit Delville Wood each year. The panel, executed by Jo Roos, de­picts the participation of South Africans of all population groups in campaigns fought during World War I. The panel includes a scene of the sinking of the troopship, HMT Mend!, off the Isle of Wight, in which 600 Black South Afri­cans on their way to France, lost their lives on February 21, 1917. The role played by Coloureds and Indians is also shown. There are scenes of the first tanks, of trenches, soldiers in gas­masks and other aspects of war in those days. South Africa's contributions to World War II and the Korean War are de­picted in the scenes on Tienie Prit-chards's panel. The names of the fallen in different battles, are recorded in an illustrated roll of honour which has a permanent place in the commemorative museum. Colonel A. Cilliers MC, senior staff offi­cer of the South African Military Vete­rans Administration, undertook pains­taking research to make the list as comprehensive as possible. At head­quarters in Pretoria Captain A. Jones, who did all the artwork on the book, keeps a copy and an index to record all new relevant information. The museum was built by the South African Department of Public Works in co-operation with a well-known British architectural firm and with the services of French contractors. A British archi­tect, Mr E. Mansfield, supervised the building on a continuous basis in co­operation with Mr C. Green, Deputy Di­rector of Architectural Services of the Department of Public Works, who pre­pared sketch plans departmentally in South Africa. The working drawings were prepared in England and France. The monument, the museum and the wood form a unity, supplemented by the cemetery of the Commonwealth War Graves Commission, across the road to Longueval, in which 151 South Africans of whom only 82 are identi­fied, lie buried among other soldiers of`the then British Empire. The Cross of Consecration in the centre of the museum complex is a symbol of the sacrifice and ideals of the members of the South African Forces who volunteered for the service in the Free World. The cross, which commemorates all South Africans of all races who died in campaigns on foreign soil, has the additional symbolism of the individual right of any South African to worship in the faith of his or her choice. The State President, Mr P. W. Botha meets artist Mike Edwards and his wife at the panel which was the work of Mr Edwards (left picture). Sculpter Danie de Jager, left, President and Mrs Botha and Mrs E. de Jager beside the panel executed by Mr de Jager (right picture). President P. W. Botha shakes hands with sculptor Jo Roos. In the background is Commodore H. F. Nel, of the Museum Service of the South African Defence Force, and Mrs Roos (picture at left). Sculptor Tienie Pritchard explains aspects of his work to the State President, Mrs Botha and Professor Hudson Ntsanwisi, Chief Minister of Gazankulu (picture at right). 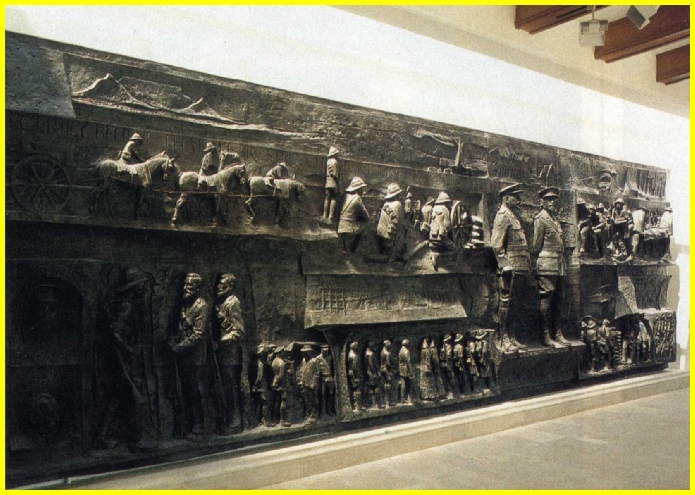 South Africa's participation in different parts of the world in World War I is depicted on this panel, by sculpter Jo Roos. Trench scenes are depicted as well as field ambulances and military orderlies carrying away the wounded. There are also representatives of the first tanks and of infantry storming a position. The big scene, second from right, depicts the drowning of Black South Africans on the troopship, the HMT Mendi, off the coast of France on February 21st, 1917. Four huge murals adorn the passages linking the different bastions of the museum. 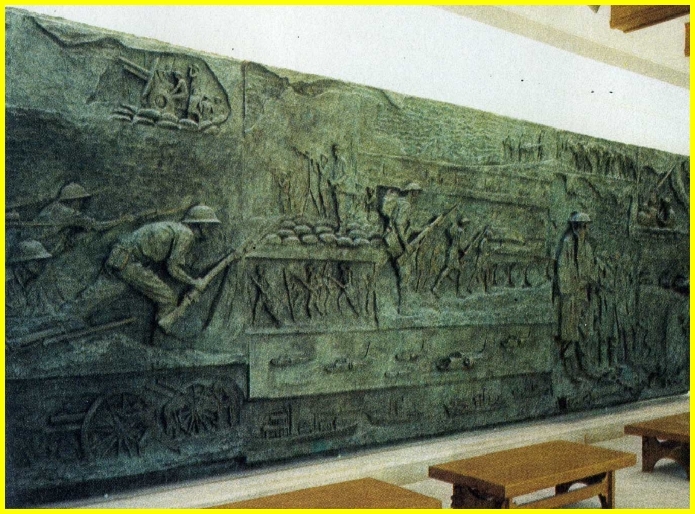 The first panel, from the left, is the work of sculpter Mike Edwards and shows scenes of South Africa's participation in campaigns in different parts of the world in World War I. 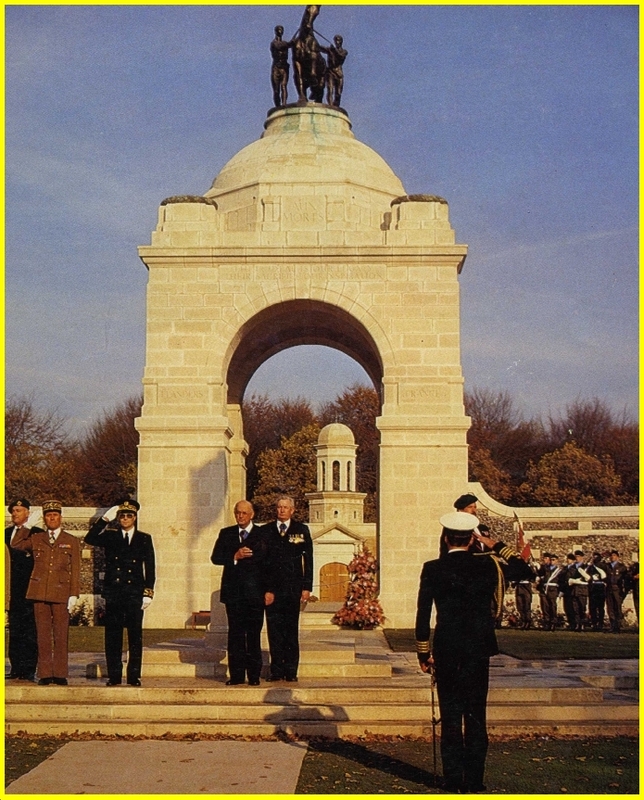 The full-length figures at right are General L. Botha and Field Marshal J. C. Smuts. A group of weary soldiers leaving the battle scene after six days of hell at Delville Wood is the theme of this panel, executed by sculpter Danie de Jager. The fourth panel, by Tienie Pritchard, represents South Africa's contribution to World War II and the Korean War. In this panel are scenes of the campaigns in Abyssinia (Ethiopia), North Africa, the Western Desert and Italy, and the participation in the Korean War. The bronze statue on top of the South African National War Memorial at Delville Wood, erected in 1926, is the work of artist Alfred Turner. 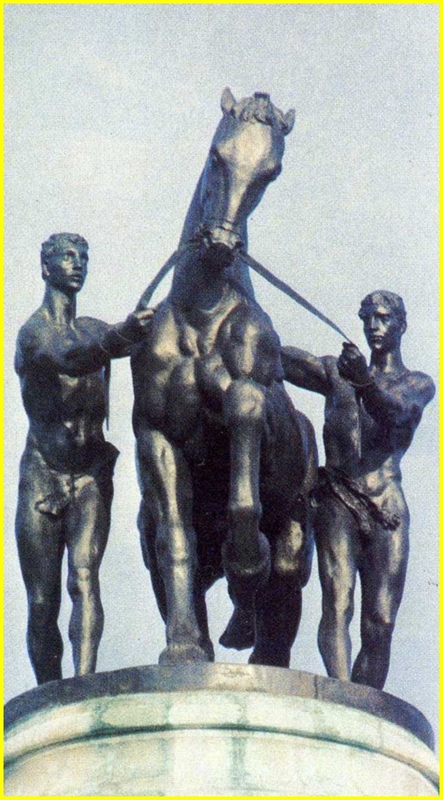 It is based on the legend of Castor and Pollux and is a symbol of how South Africans of all races stand together for the common good of their country. 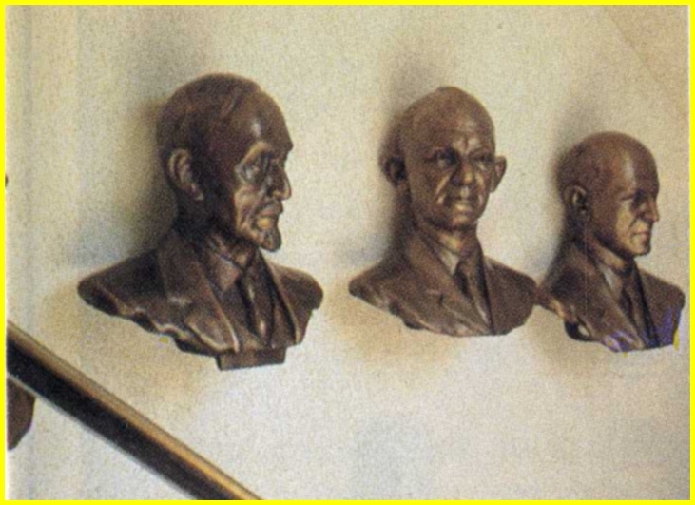 Busts of three of South Africa's most famous military figures. From left, Field Marshal J. C. Smuts, General D. Pienaar, and General Sir Pierre van Ryneveld. Sculptor: Philip Minnaar. 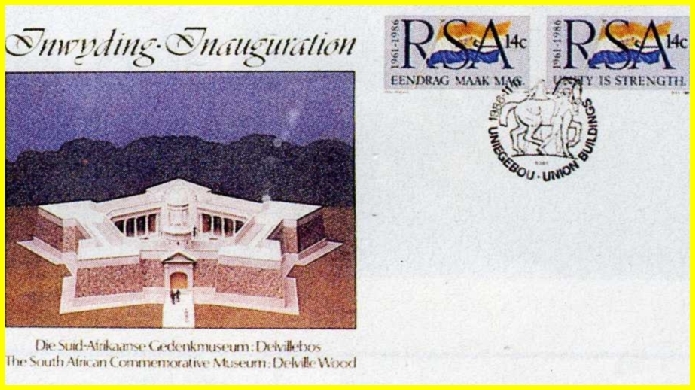 A special commemorative envelope was issued by Intersapa and the Department of Posts and Telecommunications on the occasion of the inauguration of the South African Commemorative Museum at Delville Wood, on November 11, 1986. 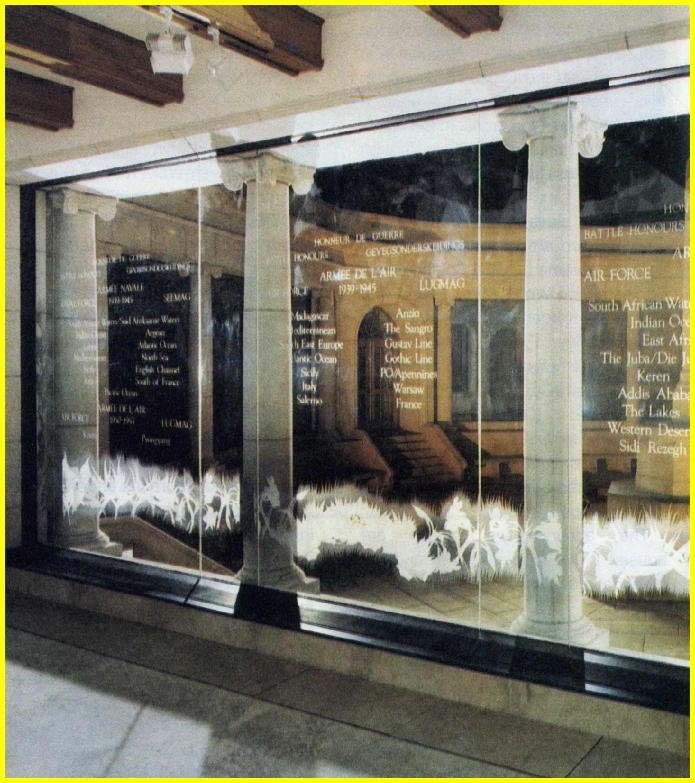 The battle of honours won by the South African Forces in different wars, are engraved on the large glass panels which front onto the courtyard of the museum. The borders of the panels are engraved with the South African national flower and the flower emblems of the four provinces. Representatives of five Black national states within the borders of the Republic of South Africa - Kwazulu, Lebowa, Kwandebele, QuaQua and Gazankulu - laid wreaths during the ceremony. Here the Chief Minister of Lebowa, Dr Cedric Phatugi lays a wreath. Standing sentry, at right, is South African military veteran A. C. Becker. Representatives of the republics of Transkei, Venda and Ciskei, laid wreaths at Delville Wood. Here President T. V. Ndamasi of Transkei lays a wreath. Behind him, to the left, is Minister (Captain) A. M. Madzivandila of Venda and far left, Chieftainess N. Tshatshu of Ciskei. The South African sentry (at left) is military veteran F. J. W. Geldenhuys. Flag bearers of the South African Military Veterans Organisations, lower their colours in respect to the fallen during the playing of the Last Post. While two South African Defence Force men, Sergeant T. B. Cole (left) of the Army Band and Corporal B. E. Bothma, of the Air Force Band, play the Last Post and the national flags of France and South Africa are lowered to half mast, members of the French veterans organisations, Association Fraternelle des Anciens Combatants Francaise and I'Union Fraternelle des Anciens Combatants Francaise, and others, lower their colours in honour of the fallen. 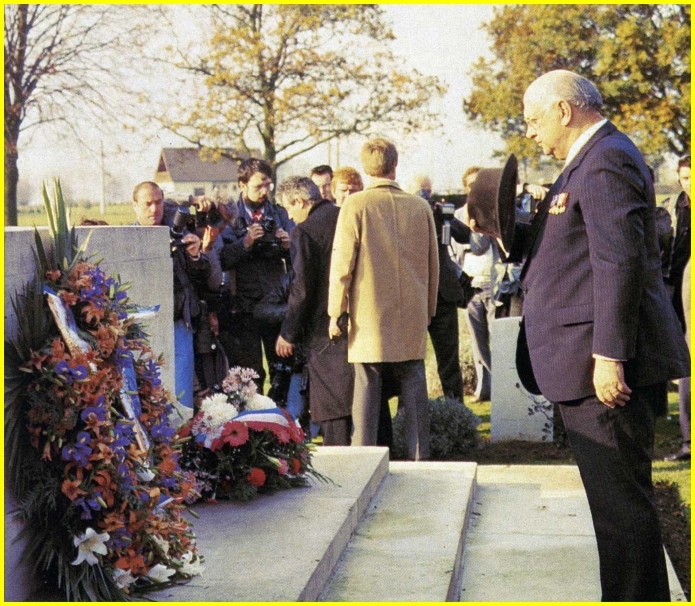 President P. W. Botha laid a wreath at the Stone of Remembrance in the Delville Wood cemetary, where 151 South Africans lie buried among other soldiers of the then British Empire who fell there in World War I. The guests were entertained to a light lunch after the commemorative ceremony. On this occasion President P. W. Botha was introduced to World War I veterans. 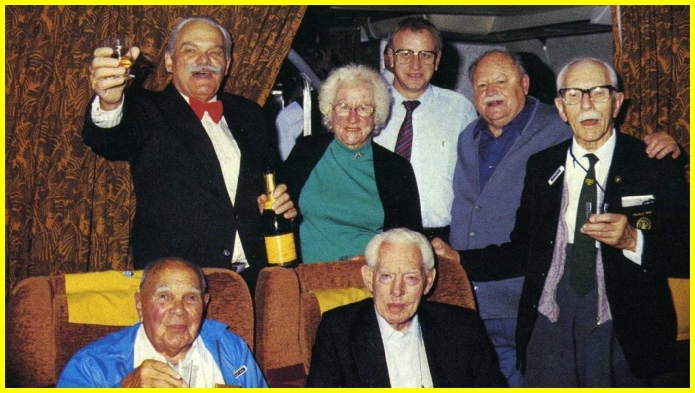 From left, Colonel V. Wepener, a Delville Wood veteran, the State President, Ms M. M. Lovell, a nursing sister in World War I, Mr H. E. Farrow, Major-General K. van der Spuy, a fighter pilot with the Royal Flying Corps, Mr F. Ferreira and Major-General H. G. Willmott, Major-General N. N. Webster, chairman of the Council of Military Veterans Organisations and Dr L. A. P. A Munnik, Minister of Public Works, are at right. Mr Justice M. T. Steyn, at back, chairman of the Delville Wood Commemorative Museum Fund Raising Commitee with two World War II military veterans who attended the Delville Wood ceremony. 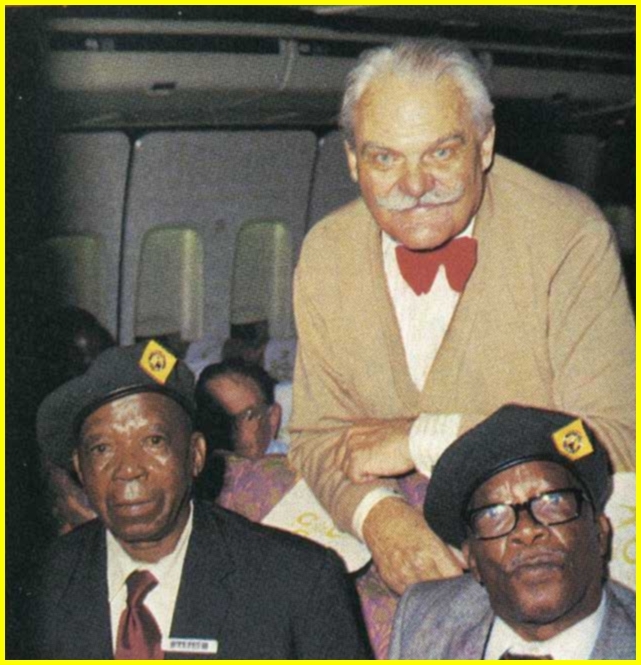 At left is Mr N. Mabane of the South African Air Force Headquarters in Pretoria and next to him, Mr M. Letudu of Cullinan, near Pretoria (pictured at left). 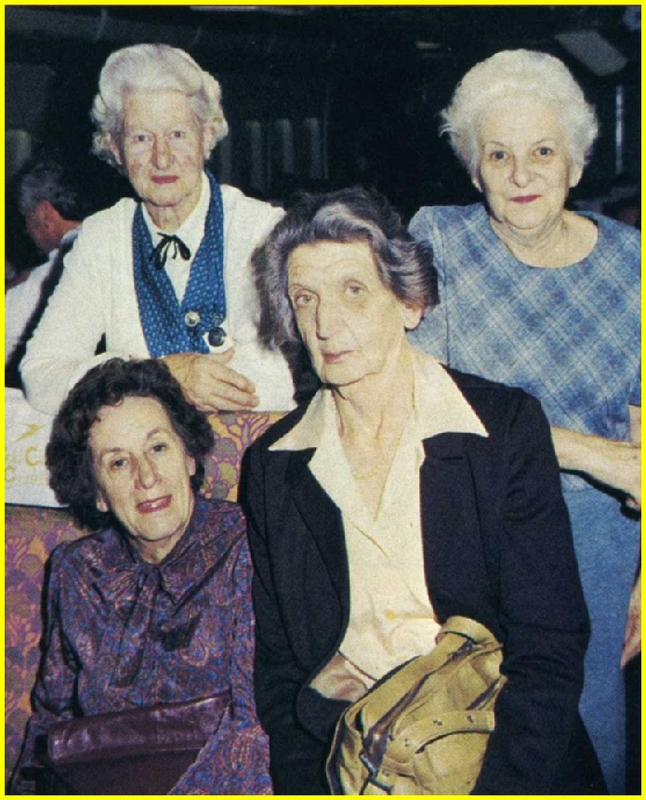 Ex-service women, who represented the four arms of the women's auxillary services during World War II, formed part of the Delville Wood contingent. At back are Ms T. Harris, South African Women's Auxillary Army Service (WAAS) and Ms A. Powell, South African Women's Auxillary Air Force Service (WAAFS). In front are Ms H. Field, South African Women's Auxillary Naval Service (SWANS) and Ms M. van Straaten, South African Military Nursing Service (SMNS) (pictured at right). 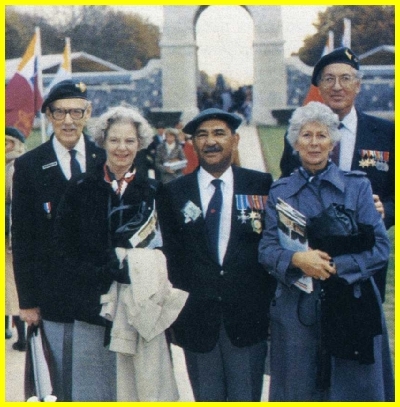 Among the World War II veterans and their wives who attended the Delville Wood ceremony were Colonel A. D. Cilliers, MC, senior staff officer of the South African Military Veterans Administration and Mrs Cilliers, Mr W. B. Francis (middle) , National President of the Cape Corps Ex-Serviceman's Legion, Mr C. Cilliers (at right back), Transvaal representative of the fund raising commitee and Mrs Cilliers. 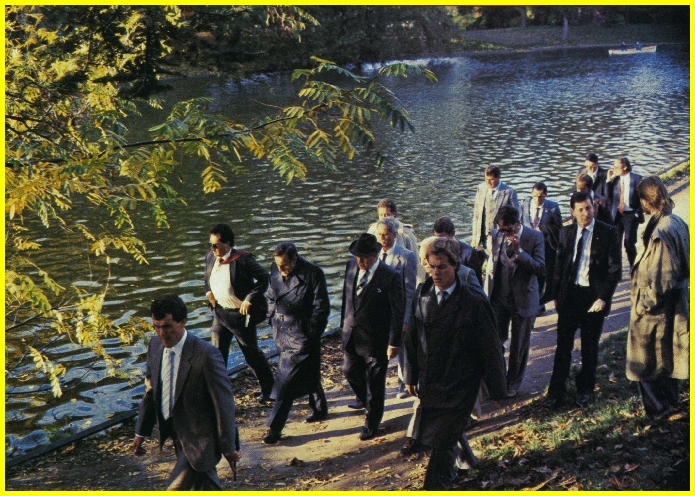 The day before the remembrance ceremony at Delville Wood, President P. W. Botha, the Minister of Foreign Affairs, Mr R. F. (Pik) Botha and other South African officials stroll in the Bois de Boulogne, in the heart of Paris. Part of the cemetary of the Commonwealth War Graves Commission of Delville Wood.